Cloudy and Cold, Water Temp 49* and Stained. Got out early and caught Herring and met Richard at the dock at 6:30. Set up over 22' of water with 10 Boards and a Bobber pulling deeper flats and points since the cold front hit so hard last night. Before I got all the boards out we started getting hit. In the first hour we had over a dozen strikes then it slowed down some when the east wind starting blowing. We tried some shallow areas and put some baits up on the bank but the fish were hurt from the cold front and only hit over deeper water. We fish several different areas today but it seemed everywhere we fished we would get hit but never numerous strikes in any one area. 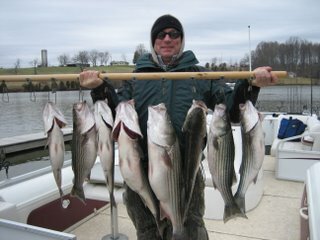 We had 25 hits today and caught 14 Stripers, keeping 8 fish to take home . Once the lake warms just a little fishing is going to break loose.